The crisp cool mornings have arrived with the changing colours of our trees, and the early evening smoke clouds from chimney tops from warm lit fires. Autumn is here, and with it beautiful Autumn vegetables. Pumpkins, Squash, Parsnips and beautiful, beautiful Beetroot. 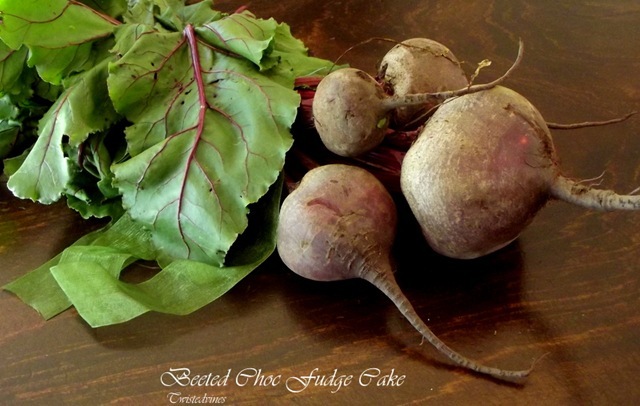 I bought this beautiful bunch of beetroot from our local Organic Grocer, such wonderful fresh produce, this bunch cost AUS $3.50, and I used it for a couple of dishes. 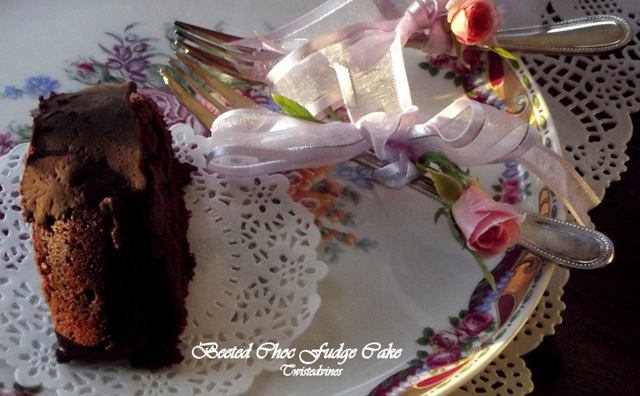 My first idea was to make that gorgeous magenta rich Bosch soup, but I didn’t have too many green flags on that one..so I thought I might be a little sneaky and make a chocolate fudge cake..everyone loves chocolate! I had seen red velvet cupcakes before made with beetroot, lower in calories and beetroot gives the mixture a smoother, moist texture. Scouting through many wonderful new and exciting beetroot dishes, I found this one from the ‘girls’ from the BBC program ‘Cook yourself Thin’, I have adapted it due to the amount of coffee in it, not good for the smaller generation. 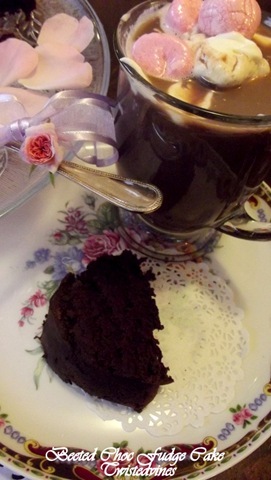 It is however a beautiful moist textured cake, and no one would ever know that there’s beetroot in the recipe. 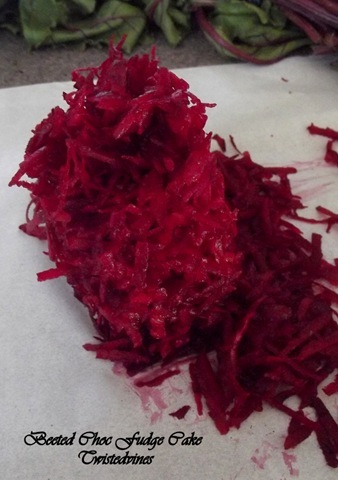 250g raw beetroot peeled and finely grated. (from the bunch I used only the large beet to give you some idea of quantity, about a cups worth. 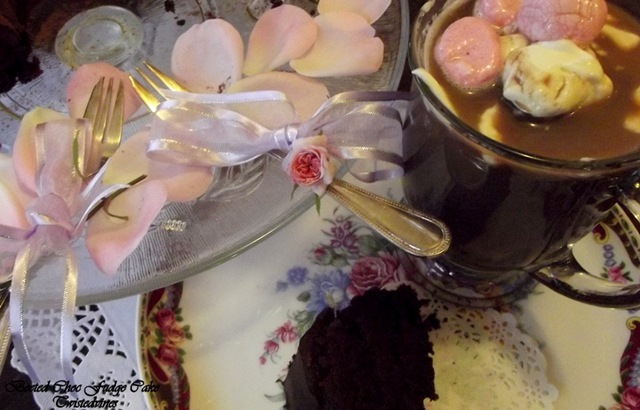 I’ve broken up the preparation part of this recipe…preparation is so important for this recipe, as it’s easier for the combination of wet and dry ingredients, and the inclusion of melted chocolate, and grated beet, if everything is ready on your work surface. Preheat the oven to 140°C, a really slow cooking cake. 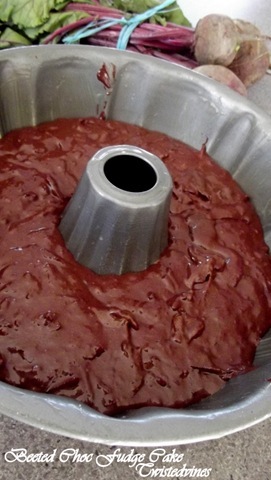 Prep your cake tin by greasing the surface with a little bit of oil or melted butter , I used a Bundt round cake tin. Less cooking time also. Melt the chocolate gently in a bowl over a pan of water until melted – over a gentle flame, and set aside to cool. 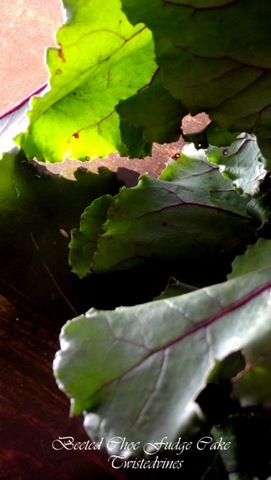 Grate finely the beetroot – TIP: wear gloves, cover the surface with a piece of grease proof paper…we’re not redecorating the kitchen and painting everything magenta. Prepare the sifted flours: self raising flour, all purpose flour, cocoa powder,almond meal, bicarbonate soda and salt. Cream the butter and sugar, adding the vanilla extract, maple syrup and honey. Beat for 3 minutes, with an electric hand beater, until fluffy. Gently fold through dry flour mix until all fully incorporated. 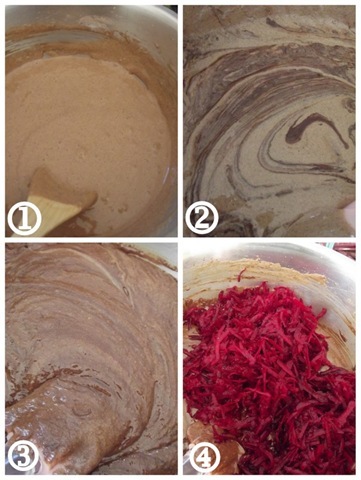 With a spatula gently fold in grated beetroot, until thoroughly mixed together. Pour mixture into prepared cake tin and place in the middle of oven for 1 hour and 30 minutes. Test the cake by inserting a squewer into the centre to see if it comes out clean, with the Bundt cake tin, I tested my cake after a cooking time of an hour…mine was done. 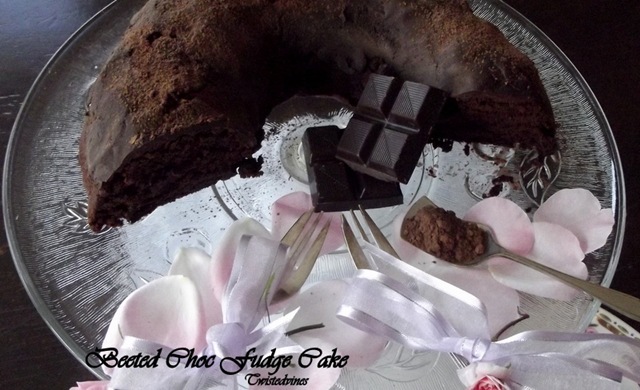 To make the fudge topping, melt 150g of good quality dark chocolate in a bowl over a pan of of hot water, then remove from heat and add a teaspoon of vanilla extract. At this stage the chocolate will seize up slightly, but then relaxes back once 3 tablespoons of honey is added and gently mixed in. Set aside to cool for 15 minutes before icing the cake. Dust with a sprinkling of cocoa powder. 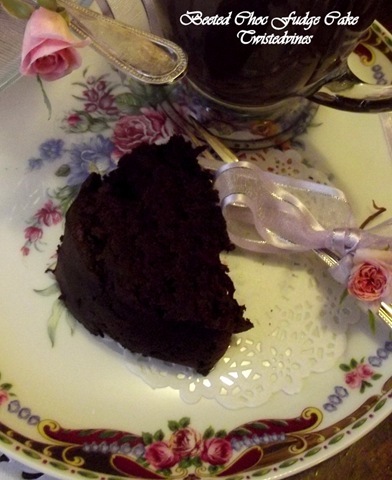 The adults did indulge in a pot of coffee, I made hot chocolate with cream and marshmallows for the younger generation, and shhhhhh, I’ll tell you a secret, they didn’t know there were any vegetables in this moist, chocolate fudge cake. That’s our little secret! Enjoy, my friends and have a great day. 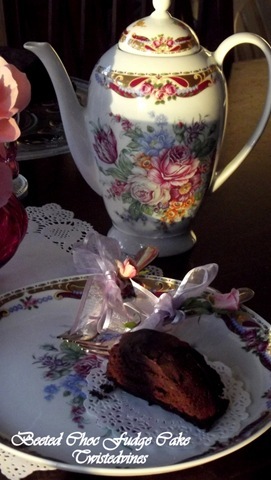 What a decadent looking cake Yvette. Delicious! Yvette, this is a nice idea. I’ll be making this recipe. Your images are lovely. I love the addition of beets! Sounds so moist and wonderful! Yvette, this sounds absolutely divine!! I will have to come back for the recipe as I’m in a hurry this morning, but I will definitely love to try this cake. 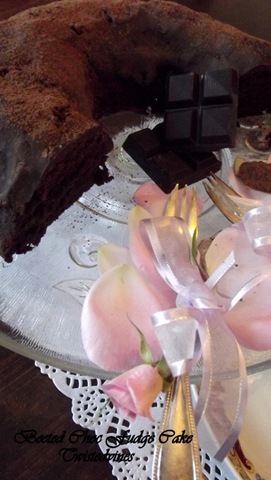 And how wonderfully mostly healthy it is…with the almond meal, beet root, dark chocolate, maple syrup and honey…Yummilicious! Thank you for sharing this. And as always, the most beautiful photos!!! Yvette, I am IN LOVE with this cake. It looks so devilish and dark but really it’s quite an angel, isn’t it? So glad you shared this! 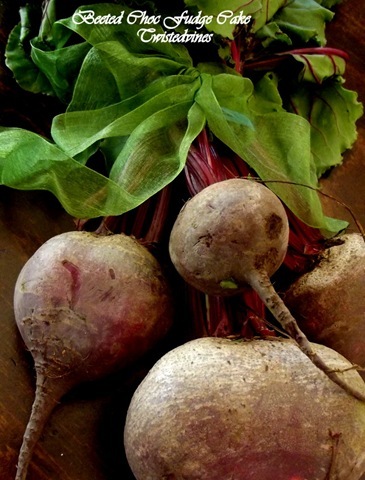 Yvette~ This is the ONLY way I would eat beets! 🙂 Your cake looks beautiful and what a gorgeous coffee pot & platter!! I wanted to let you know that Jain is not going forward with FFT with blogger changing their format~ she says she is done with blogging 😦 I’m at a loss at what to do and may only participate hit or miss with the rest of the list, it seems wrong since it is her baby. Thanks for joining in the fun, wishing you a delicious autumn! All looks and, I’m sure tastes, so fabulous!